I wanted to wait until I installed 2.03 to make this post, but as the IE Mod's maintainers haven't been around since mid-October, I prefer to wait with the patch as I'd rather stick to 2.02 with the mod than to play without. So here's a build update. Pick up the sword in Dyrford as soon as you can. Even though you'll be missing out on the damage multiplier until you're in Act III, the early +12 bonus to Accuracy will make you crit a lot, which is the meat and potatoes of this weapon choice. For this build, you will want to ditch the Knights of the Crucible and side with the Doemenels in Defiance Bay. This will grant you the Merciless Hand talent, which gives you another +30% crit damage bonus. Another +10% will come in Act III from the Dungeon Delver talent that was already part of this build. When all is said and done, your crit damage multiplier will be 50% (crit) + 50% (Annihilation) + 30% (Durgan Steel) + 30% (Merciless Hand) + 10% (Dungeon Delver) = +170% and your crits will prone your target to boot, thus making it more likely for you to land a crit the next time. The prone-on-crit effect also works in combo with Apprentice's Sneak Attack, granting you an additional +15% damage on your next attack. A major drawback of this choice is that if you want to crank it to 11, you need to invest 2 Sky Dragon eyes to make it Superb. The same is not true of blades that already come with the Superb enchantment, like Tidefall. With this build, you'll have an attack animation of 24 frames and a recovery of 33 frames (29 + 4-frame delay), which is pretty good for a two-hander in plate armor with Vulnerable Attack (this is assuming you sip a potion of Deleterious Alacrity of Motion, which I strongly advise you do at the beginning of every encounter.) However, if you want to attack even faster, you may want to check this other option. Switching from Great Sword to Estoc means you lose something on flexibility, as Great Swords conveniently deal Slash/Crush damage and Estocs only deal Piercing. Now, the game doesn't feature an exceeding amount of creatures that are immune to Piercing, but you may want to keep a Pollaxe or St Ydwen's Redeemer in your second slot to handle just those cases. The Blade of the Endless Paths already comes with the Superb enchantment, which means there's no Sky Dragon eyes expenditure to go through to maximize your damage output. Vulnerable Attack stacks with its 5 DR bypass property, so you can have a 10 DR bypass to complement your ridiculously high DPS. If you want, you can swap your Gauntlets of Accuracy for Ryona's Vambraces to get an extra 3 DR bypass, for a total of 13. This is going to be particularly useful against high-DR targets such as Adra Animats and Dragons, but way overkill against most other enemies so you may consider swapping bracers depending on the enemy you're fighting. Props to Boeroer for suggesting this. CC immunities mean your Knock Downs won't always be the "get out of jail free" card they used to be. However, the addition of a +20% damage multiplier to them means they remain relevant even against enemies that are immune to the prone affliction. Into the Fray also gets scaling damage, and it would be an excellent ability if it wasn't so damn easy for its pull effect to be blocked by pretty anything that might stand in the way between your target and you. However, because it is so easy for your enemy to be blocked and stop at a distance from you, I still advise against taking Into the Fray. Armored Grace gets a boost from -16% to -20% recovery penalty. A great ability has just become better. A must-have it was, and a must-have it remains. Look how cool I am, or of Shameless Self Promotion. Edited by AndreaColombo, 30 October 2015 - 02:16 PM. I like both weapons a lot - but since I used Hours of St. Rumbalt a lot with rogues and barbs I now would vote for the Blade of the Endless Paths. Most of the time you can just turn off Vulnarable Attack - but against those high DR dudes 10 or even 13 DR bypass will be so sweet. The quarterstaff on level 3 of the Endless Paths (need the Sabre for the statue) also has the speed enchantment as well as reach. Works nice on Ciphers who try to stay out of melee range. Another thought is to use Half Mast - Superb, overbearing pole ax and swap to Blade of the Endless Paths for the speed whenever the prone effect is not needed or is immune. Not sure how exactly you get it from the Adra Dragon and it does come really late in the game but it starts with Superb so there is that as a bonus. soldier focus really is the absolute best weapon group in the game. great sword 1: tide fall. nuff said. 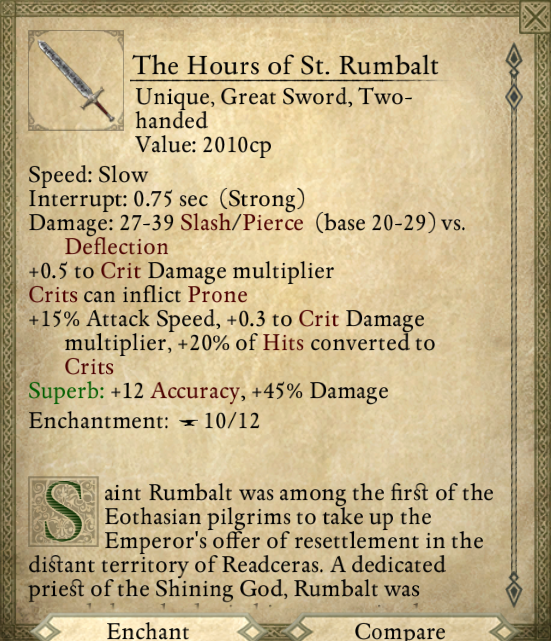 great sword 2: the hours of st. rumbault = prones on crit, extra crit dmg. 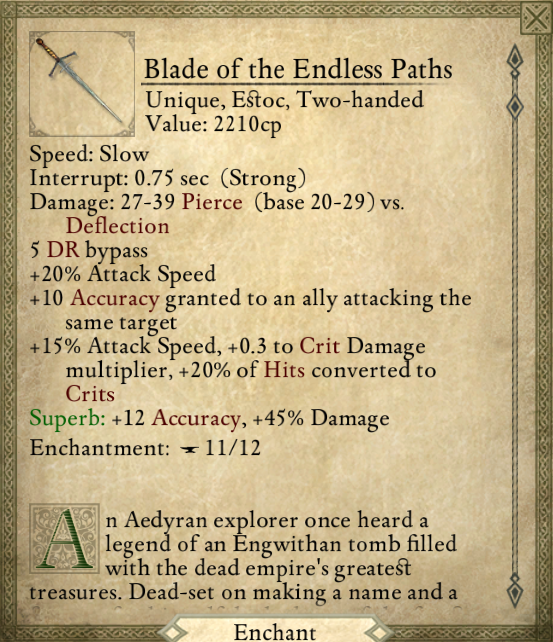 great sword 3: the temaperacle = prones on crit, comes w/ corrosive-lash already enchanted. pike: tall-grass. prones on crit, extra crit dmg, AND higher chance of critting. this is what my 4 martials rock; PC/Eder/Zahua/Pallegina prone-critting everything in sight is hilarious ! all 6 weapons from soldier group. plus great swords deal slash/pierce, for dealing with pesky immunities. but wait! there's more! WARHAMMERS. for the crushing backup weapon, we get from soldier focus group the excellent Strike Hard, the Godynthur (STUNS ON CRIT!!) and the other one that's sold in Hearthsong that has the Speed enchantment. Not to mention that the Shatterstar (war hammer) causes 1 sec interrupts and has +0.5 crit damage multiplier (if I recall correctly). The high interrupt is not mentioned as enchantment. This weapon is great for an interrupting build since it's faster than morning stars. Together with the stunning war hammer in dual wield style this is a great disabling setup. Then there is also Aedrin's Wrecker, a superb arbalest that prones and stuns on crit. I'd also say that soldier is the best weapon focus overall. But back to the ladies: I would also use Half Mast as a backup weapon for The Blade. All these stupid rain blights that are immune to pierce damage really annoy me. You can get that if you talk to the Adra Dragon and agree to set her free. Then go to the shrine in the northeast of Black Meadow. There you'll find the Dragon Huntress - Falonriddledididdle or something like that. Don't use the dragon's medaillon on her but instead kill her (I don't think you get all the loot when you use the medaillon). That not only plsses off the dragon big time but also gets you Half Mast and the Autmn Fire armor (right?). correct! i'm pretty sure half-mast is the only magically unique pollaxe in the game, too. too bad it's a fairly late acquisition, as you need to reach the bottom level of Caed Nua and talk to the adra dragon as a requisite. another thing about most of these unique weapons from the soldier focus group is that you can get them all relatively early. You can get the The Temaperacle great-sword as soon as you reach ondra's gift, then go and buy Tall-Grass over at Dyrford village, along with The Hours of St. Rumbault. Drake's Bell estoc, which has the 3 DR "rending" enchantment, which of course stacks with the estoc's natural 5 DR bypass; tack on another 5 DR bypass from Vulnerable Attack, and finally ANOTHER 3 DR bypass from the Vambrace Bracers which you can get really early by making a bee line to the alpine dragon and sweet-talking him (resolve 17). sure, it ain't no fancy prone/stun on crit effect, but 16 dr bypass per swing is no laughing matter! Edited by AndreaColombo, 31 October 2015 - 12:45 AM. I'll echo Deus2015's comments. It's been helpful in breaking down the relationships in the game and how/where to find the components one needs to stack the benefits you expect characters to exploit. personally i only really learned the game's mechanics when i first played POTD. i'd finished it once on normal, and had abandoned halfway through a Hard playthru when i decided to say, screw it gonna do PotD. 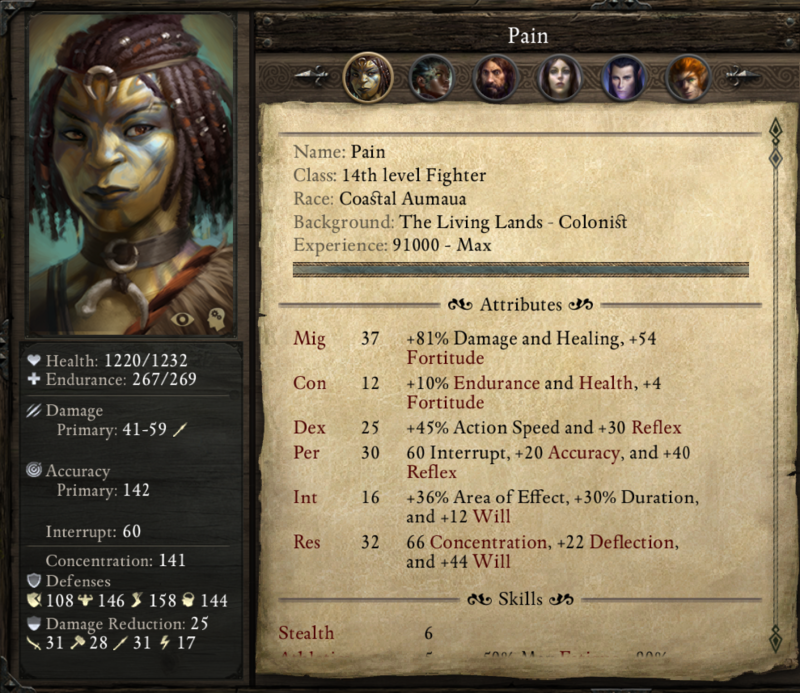 it obligates the player to read bestiary entries, pay attention to resistances, immunities and afflictions, and forces the player to often make strategical use of their consumables, such as potions of endurance for the many, many emergency heals on PotD fights you'll be doing, potions of recovery to mitigate the constant onslaught of afflictions, and at least for the first half of the game promotes cooking some food to get an edge. i'd never ever done a single one of those things in the normal or hard playthroughs. it was like playing an entirely new game. so i recommend playing potd if you want to learn to game. now's the perfect time to start a new run, what with 2.03 patch and the slew of new immunities. Edited by aweigh0101, 03 November 2015 - 01:13 AM. I've never been a big user of poleaxes, but I do find it a little annoying that there are so few unique ones, as well as clubs, in the game. I that the Devs would rectify this by looking at the list of unique weapons and backfilling any unique weapon types that are in short supply. And BTW, it's even a little worth worse when you consider Half-Mast since it can only be gotten by killing a certain character, which if you made a different choice along the way, you might legitimately choose not to kill. It'd be nice if there were 1 or 2 more unique poleaxes in more general locations, i.e. treasure chests or stores. On a side note, it bugs me that poleaxes aren't reach weapons and quarterstaffs are. IMO, this is 180* out of phase. But the situation would still be a lot better if Qstaffs remained reach weapons, but poleaxes became reach weapons. It seems dumb to have 2 two-handed weapons in the Adventurer group without one of them being a reach weapon, particularly when historically (I think) one would always think of pole axes as very long (aka reach) weapons. Also, it bugs me that Qstaffs are reach weapons, because that's just not the way that staff fighting is ever portrayed. It seems to me that true reach weapons are long, pokey types of weapons that you hold down near the end of the staff/pole, whereas Qstaffs are fought by holding the staff around the middle, which would pretty much negate any use of whatever "reach" it might have. Meh. Regardless, this is just a pet peeve of mine. Edited by Crucis, 03 November 2015 - 08:10 AM. If I have to hazard a guess here, pole-axe is not a reach weapon for reasons of balance. All reach weapons have a single mode of damage. Pole-axe's slash/crush modal is already incredibly flexible. If it has reach then there will be few reasons left to chose any other reach weapon, to the point where it would be oppressive to weapon diversity and player choice. wbc, I guess that my problem here is that poleaxes are what they are. They ARE long weapons. That's just a fact. They're not in-close melee weapons, and trying to say otherwise doesn't pass the laugh test. They can (if they so choose) claim balance issues. I don't care. Poleaxes are LONG weapons. Period. Longer than legitimate quarterstaffs. And at some point reality shouldn't be so casually tossed aside on the bloody alter of game balance. Balance around the reality of poleaxes, don't just ignore it because it's too inconvenient. Does anyone have a recommended party set up for this build? I just started a new character, planning on focusing on a crit build with St Rumbalt. So far I'm planning on priest, wiz, and cipher. Not to sure what else will compliment this build well? Sagani is a favorite of mine and does incredible damage at higher levels. Also considering Hiravas and Kana because I haven't done a full play through with either of them. Opinions would be very welcome. P.S. can St. Rumbalt have superb + lash on it? Hours of St. Rumbalt can indeed be made Superb and have a lash. My bad for not thinking about it—clearly an extra 25% damage is a must on this build You may even want to skip the talent Bonus Knock Down (seeing as many enemies now appear to be immune to the Prone affliction; guess 2 Knock Downs per encounter are enough) and go for the elemental talent that matches the lash of your choice to get another 20% damage on top of it. Edited by AndreaColombo, 04 November 2015 - 09:37 AM. Ya a green sword would be a large problem to say the least haha. I'm leaning towards shock. I'm considering going with Hiravas(shock wildstrike build) and use Stormcaller on my Cipher. Haven't played with Hiravas much yet so it would be fun to try. I think I'll probably go with a Darcozzi pally for my second tank. Zealous Focus + Critical Accuracy and the +10-20 accuracy from Liberating Exhortion, it just works soo nicely with a crit focused build. Edited by Mocker22, 04 November 2015 - 02:51 PM. To boost Accuracy, the best combination is Scroll of Valor + Devotions for the Faitfhul + Champion's Boon. That's +45 Accuracy. BOOM! Would those buffs not stack with the paladin buffs...or does it just make them a bit overkill? Champion's Boon gives a +10 bonus to PER, which in turns gives +10 to Accuracy so it is an "indirect" buff. It definitely stacks with the Paladin's abilities. Devotions for the Faithful gives +20 melee Accuracy and +20 ranged Accuracy, which means it stacks with direct buffs that generically apply to "Accuracy" without specifying whether melee or ranged. Hence, it stacks with the Paladin's aura; not sure about Liberating Exhortation because, IIRC, it does not buff Accuracy but rather suspend debuffs. Scroll of Valor is a direct bonus to Accuracy, and does not stack with the Paladin's aura. The aura's still relevant in case you run out of scrolls or the scroll's duration expires, though. As a side note, QA just confirmed that Dire Blessing does stack with Durgan Steel's hit-to-crit conversion, contrary to what I wrote in my post above. In light of this, you definitely want to spam that spell in every encounter on your crit build. man, what i hate the most is corrosizelash's super ugly looking drip-drip-drip VFX. it's the reason i never use it. i hate the fact that my rogue's dual sabres are leaking acid all over a poor guy's tavern wooden floor burning a hole to china and no one notices. the varnishing cost alone must drive the innkeepers crazy! best looking enchants imo are burning (it's aight) and winner is the godlike looking spirit-slaying enchantment, and second place freezing lash. best looking over all is putting freezing lash then spirit slayer, the spirit slayer's red hue blends very well with the white-hot glow of freezing enchant.